This is a large part of our business producing high volume for the furniture trade as well as bespoke items for interior designers. We have a large stock of samples for you to choose from or you can design your own creation for us to turn. We also have a wide range of samples for table leg designs for you to choose from, farmhouse, refectory and coffee table legs, no matter what your tastes, be it traditional or contemporary. 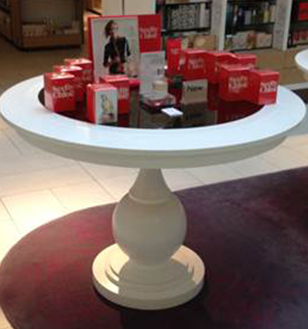 Photographed on the left is a recently completed display table for John Lewis.